Ideal for women and men who want the look and feel of underwear. Soft, stretchable, cloth-like back sheet provides an incredibly secure and comfortable fit. I WISH I COULD GIVE A NEGATIVE STAR!!!! It is bad enough if you have to wear one of these (REGARDLESS your age!!) but these are garbage! They leak out the sides and don't absorb at all!! 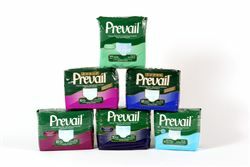 Prevail is from the company called "First Quality" ... Now that is a LAUGH!! !